Pumpkin Lasagna sounds a little strange, right? Even though it gets put in a lot of sweet seasonal things, pumpkin is just another squash when it comes down to it, and it makes an absolutely delicious lasagna! I made a full batch of this and it has made many a lovely lunch and dinner for Tim and me. If you’ve never tried pumpkin in a savory dish, I would definitely recommend trying this out – it is definitely going to become a regular dinner item in this house! This recipe reflects a few minor changes I made (and wish I had made) to the original. When you’re making it (and shopping for it), it seems like a TON of ingredients, but as long as you divide the pumpkin and cheese mixtures evenly between the layers it turns out perfectly. In a large skillet, heat the olive oil. Add the onion and cook over moderately low heat until softened, about 10 minutes. Add the Swiss chard and cook over moderate heat, stirring frequently, until wilted and no more liquid remains, about 8 minutes. Stir in the garlic and cook until fragrant, about 1 minute. Season the chard with salt and pepper. Transfer to a plate and let cool slightly. In a medium bowl, mix together the pumpkin puree, heavy cream, and cayenne. Season with salt and pepper. In another bowl, mix the ricotta with the eggs, 1 1/2 cups of the Parmigiano, 1 cup of the fontina and 1 1/2 teaspoons of salt. In a well-buttered, 9-by-13-inch ceramic baking dish, spoon 1/2 cup of the pumpkin mixture in an even layer. Arrange 3 or 4 lasagna noodles in the dish, overlapping them slightly. Spread half of the remaining pumpkin mixture over the noodles in an even layer. Top with half of the Swiss chard and another layer of noodles. Cover with half of the ricotta mixture. Repeat the layering with lasagna noodles, pumpkin, Swiss chard, another layer of noodles and finish with the ricotta mixture. Cover the lasagna with foil and bake for about 40 minutes, until heated through and slightly firm. Remove from the oven and uncover. Preheat the broiler. Sprinkle the remaining 1/2 cup of Parmigiano and 1 cup of fontina on top of the lasagna and broil until golden brown and crisp on top, about 4 minutes. Let the lasagna rest for 15 minutes, then cut into squares and serve. 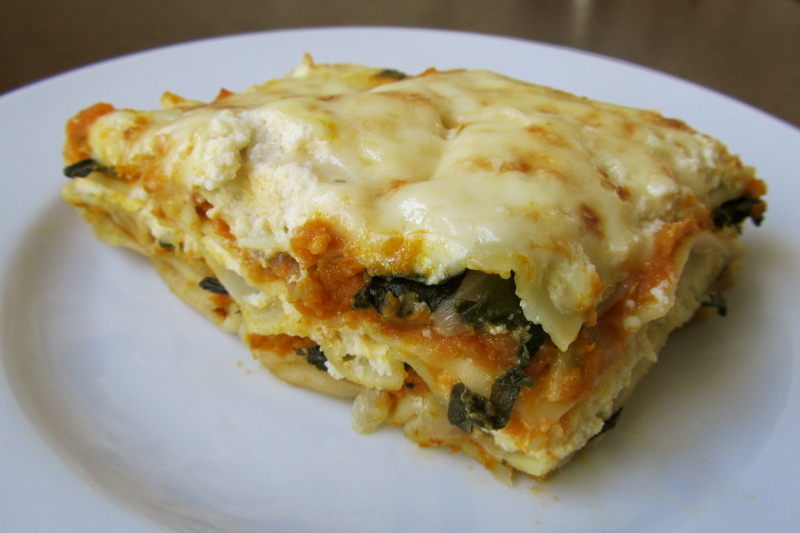 MAKE AHEAD The unbaked lasagna can be refrigerated overnight. Let return to room temperature before baking. This entry was posted in main course, pasta, vegetables, vegetarian and tagged lasagna, pumpkin, ricotta, savory, swiss chard by Laura Zolnoski. Bookmark the permalink.